From an early age, a college education was always in Elijah Secrest’s sights. “My parents always set high academic standards for us,” said Secrest, a sophomore studying media advertising at The Media School. “They didn’t have a college degree but they always expected us to do better.” But with five children at home — Secrest has an older brother and is a quadruplet — Secrest’s parents knew that college would be financially difficult. So they encouraged Secrest to become a 21st Century Scholar. Simply put, Secrest said, the program gave him a chance to make his academic dreams come true. “If it wasn’t for this scholarship, I don’t know that I would be able to go to college,” he said. Created by the state of Indiana in 1990, 21st Century Scholars helps low- and middle-income families meet the cost of college. Income-eligible seventh- and eighth-graders who enroll and fulfill a pledge of good citizenship are guaranteed to receive up to four years of undergraduate tuition at any participating public college or university in Indiana. IU Bloomington has more than 3,000 21st Century Scholars on campus. In 2007, the university created the 21st Century Scholarship Covenant program, which provides additional funding for eligible 21st Century Scholars to pay for books, room and board, and other expenses. 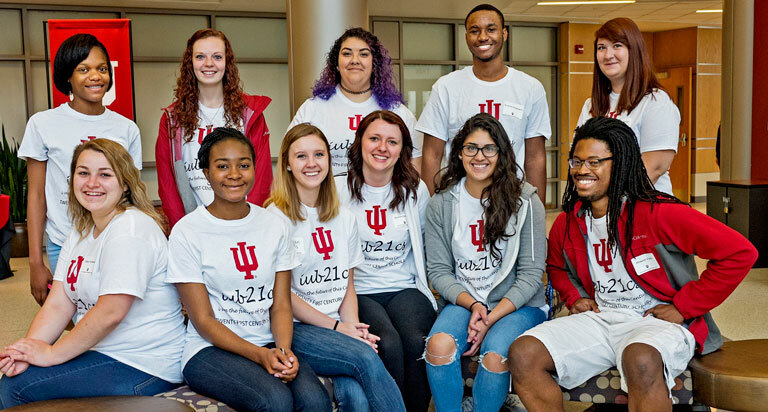 “While financial support helps a student get to college, it takes additional support to help that student actually achieve their goal of receiving a degree,” said Vincent Isom, director of IU’s 21st Century Scholars program. The initiative aims to help hundreds of Marion County students enroll in the 21st Century Scholars program and help them meet the requirement of a college campus visit. The goal is to enroll 500 new students in the program and expose 200 current scholars to the IU Bloomington campus. One of the benefits of the support services is that students take an active role in the services through employment and volunteerism. Bailey Johnson, a senior majoring in biology and minoring in chemistry, Spanish and psychology, is a 21st Century Scholar who has been serving as a tutor for the program for the past two years. A Morgantown native, Johnson admits school wasn’t always her main focus. But 21st Century Scholars, along with an early college program through her school, brought the focus she needed to prepare her for college. Now two days a week, Johnson spends time at the 21st Century Scholars office tutoring scholars who need a little extra help in Spanish, psychology, chemistry and biology. Tutoring not only helps Johnson make extra money, but it allows her to help others. “I am so grateful for the scholarship, and I wanted to help others and share advice about what I’ve learned as a student,” she said. Like Johnson, Secrest has found a way to give back to the program through the 21st Century Volunteer Corps — a student organization that connects IU students with volunteer opportunities.